In the 1930s, Bob Koke went to Indonesia in search of waves in adventure. He came back to the western world sharing tales of perfect barrels, a vibrant culture, and untouched paradise. Ever since then, surf tourists throughout the globe have followed his trail, primarily paddling out on the beloved Hindu island of Bali. If Bob Koke were to visit Bali today, it’d nearly be unrecognizable. Organic kombucha cafes with free WiFi now stand where ramshackle fruit stalls used to, monstrous hotel developments have eclipsed local homestays, and every wave with a paved road leading up to it attracts a hefty crowd even in the worst conditions. This full throttled development has not gone by unnoticed with Balinese residents either, who have now formed a movement against foreign developers. All throughout the island, flags depicting a clenched fist are flown in protest. Meanwhile, the neighboring island of Lombok trails in tourism and therefore development. Known as the Land of 1000 Mosques, Lombok has tens of world-class breaks to choose from without mega-resorts lining its shorelines. To get to the best waves you likely need to charter a fishing boat, brave dirt roads on a rented motorbike, or go somewhere so remote, you’ll have a hard time finding accommodation. 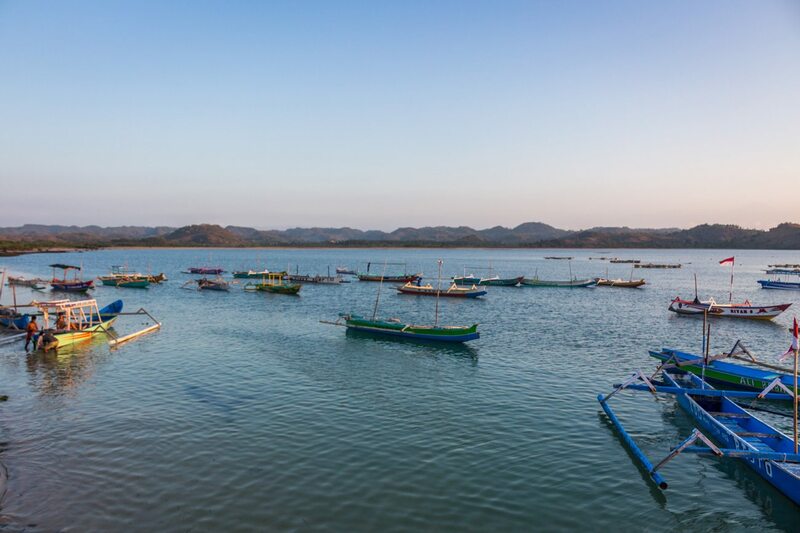 The bay of Gerupuk, a small fishing village just a fifteen-minute motobike ride from the town of Kuta, has a handful of waves to choose from that cater to surfers of every ability and stance. For $5, you can hire a fisherman to drive you to any wave of your choosing – your driver might hop into the lineup with you! There’s also the hidden break of Ekas and far away break of Desert Point, one of the longest left hand barrels on the planet. After your surf, there are a variety of white sand beaches to lounge on and warungs offering cheap, fresh fare to refuel before your sunset session. On flat days, there are a variety of hiking trails and dive spots to explore. But don’t be mistaken — despite the hurdles it takes to get to many of Lombok’s best waves, they can still attract a crowd. However, while Bali can at times feel like the Disneyland of the surf industry, visiting Lombok stokes a sense of true adventure. There are frequent power outages, wet markets on main streets, rogue cows, midnight calls to prayer, and local entrepreneurs vying for your attention. If this piece convinces you to divert that flight to Lombok, please keep the following in mind. Tourists have chipped away Balinese culture by checking into chain hotel rooms over local homestays, ordering pizza in lieu of nasi goreng, and expecting that every creature comfort be catered to by Western standards. Don’t demand this from Lombok. Let’s preserve its rich culture and natural beauty by funnelling our money into the hands of local businesses owners instead of the pockets of foreign investors. That way, we won’t have to pen an article in ten years that tells you to skip Lombok and head elsewhere instead. Lombok has an international airport near Kuta, one of the main surf towns on the island with multiple flights coming in and out daily. It is also easily reached via fast boat or public ferry from Bali. Flights tend to be more reliable than the ferries, which do not run during storms or large swells. The best way to book accommodation is to walk along the main street and negotiate prices or book online through Agoda.com. Basic rooms with a fan start at around 150,000 IDR and air conditioned rooms start at 200,000 IDR. Great deals can be found in the off-season and friendly bartering is expected. The Billabong Korea Girls visited Lombok and had a whole lot of fun….